We, the inhabitants of this ancient and historic Samsthânam of Sethu Bandha Rameswaram, otherwise known as Râmanâthapuram or Ramnad, beg, most cordially, to welcome you to this, our motherland. We deem it a very rare privilege to be the first to pay your Holiness our heartfelt homage on your landing in India, and that, on the shores sanctified by the footsteps of that great Hero and our revered Lord — Sree Bhagavân Râmachandra. We feel we cannot adequately convey in words our feelings of gratitude and thankfulness to your Holiness for your philanthropic labours towards the spiritual regeneration of the East and the West. We cannot close this address without referring to the great kindness which your Holiness has always extended to our Raja, who is one of your devoted disciples, and the honour and pride he feels by this gracious act of your Holiness in landing first on his territory is indescribable. In conclusion, we pray to the Almighty to bless your Holiness with long life, and health, and strength to enable you to carry on the good work that has been so ably inaugurated by you. The longest night seems to be passing away, the sorest trouble seems to be coming to an end at last, the seeming corpse appears to be awaking and a voice is coming to us — away back where history and even tradition fails to peep into the gloom of the past, coming down from there, reflected as it were from peak to peak of the infinite Himalaya of knowledge, and of love, and of work, India, this motherland of ours — a voice is coming unto us, gentle, firm, and yet unmistakable in its utterances, and is gaining volume as days pass by, and behold, the sleeper is awakening! Like a breeze from the Himalayas, it is bringing life into the almost dead bones and muscles, the lethargy is passing away, and only the blind cannot see, or the perverted will not see, that she is awakening, this motherland of ours, from her deep long sleep. None can desist her any more; never is she going to sleep any more; no outward powers can hold her back any more; for the infinite giant is rising to her feet. Your Highness and gentlemen of Ramnad, accept my heartfelt thanks for the cordiality and kindness with which you have received me. I feel that you are cordial and kind, for heart speaks unto heart better than any language of the mouth; spirit speaks unto spirit in silence, and yet in most unmistakable language, and I feel it in my heart of hearts. Your Highness of Ramnad, if there has been any work done by my humble self in the cause of our religion and our motherland in the Western countries, if any little work has been done in rousing the sympathies of our own people by drawing their attention to the inestimable jewels that, they know not, are lying deep buried about their own home — if, instead of dying of thirst and drinking dirty ditch water elsewhere out of the blindness of ignorance, they are being called to go and drink from the eternal fountain which is flowing perennially by their own home — if anything has been done to rouse our people towards action, to make them understand that in everything, religion and religion alone is the life of India, and when that goes India will die, in spite of politics, in spite of social reforms, in spite of Kubera's wealth poured upon the head of every one of her children — if anything has been done towards this end, India and every country where any work has been done owe much of it to you, Raja of Ramnad. For it was you who gave me the idea first, and it was you who persistently urged me on towards the work. You, as it were, intuitively understood what was going to be, and took me by the hand, helped me all along, and have never ceased to encourage me. Well is it, therefore, that you should be the first to rejoice at my success, and meet it is that I should first land in your territory on my return to India. Great works are to be done, wonderful powers have to be worked out, we have to teach other nations many things, as has been said already by your Highness. This is the motherland of philosophy, of spirituality, and of ethics, of sweetness, gentleness, and love. These still exist, and my experience of the world leads me to stand on firm ground and make the bold statement that India is still the first and foremost of all the nations of the world in these respects. Look at this little phenomenon. There have been immense political changes within the last four or five years. Gigantic organizations undertaking to subvert the whole of existing institutions in different countries and meeting with a certain amount of success have been working all over the Western world. Ask our people if they have heard anything about them. They have heard not a word about them. But that there was a Parliament of Religions in Chicago, and that there was a Sannyasin sent over from India to that Parliament, and that he was very well received and since that time has been working in the West, the poorest beggar has known. I have heard it said that our masses are dense, that they do not want any education, and that they do not care for any information. I had at one time a foolish leaning towards that opinion myself, but I find experience is a far more glorious teacher than any amount of speculation, or any amount of books written by globe-trotters and hasty observers. This experience teaches me that they are not dense, that they are not slow, that they are as eager and thirsty for information as any race under the sun; but then each nation has its own part to play, and naturally, each nation has its own peculiarity and individuality with which it is born. Each represents, as it were, one peculiar note in this harmony of nations, and this is its very life, its vitality. In it is the backbone, the foundation, and the bed-rock of the national life, and here in this blessed land, the foundation, the backbone, the life-centre is religion and religion alone. Let others talk of politics, of the glory of acquisition of immense wealth poured in by trade, of the power and spread of commercialism, of the glorious fountain of physical liberty; but these the Hindu mind does not understand and does not want to understand. Touch him on spirituality, on religion, on God, on the soul, on the Infinite, on spiritual freedom, and I assure you, the lowest peasant in India is better informed on these subjects than many a so-called philosopher in other lands. I have said, gentlemen, that we have yet something to teach to the world. This is the very reason, the raison d'être, that this nation has lived on, in spite of hundreds of years of persecution, in spite of nearly a thousand year of foreign rule and foreign oppression. This nation still lives; the raison d'être is it still holds to God, to the treasure-house of religion and spirituality. In this land are, still, religion and spirituality, the fountains which will have to overflow and flood the world to bring in new life and new vitality to the Western and other nations, which are now almost borne down, half-killed, and degraded by political ambitions and social scheming. From out of many voices, consonant and dissentient, from out of the medley of sounds filling the Indian atmosphere, rises up supreme, striking, and full, one note, and that is renunciation. Give up! That is the watchword of the Indian religions. This world is a delusion of two days. The present life is of five minutes. Beyond is the Infinite, beyond this world of delusion; let us seek that. This continent is illumined with brave and gigantic minds and intelligences which even think of this so called infinite universe as only a mud-puddle; beyond and still beyond they go. Time, even infinite time, is to them but non-existence. Beyond and beyond time they go. Space is nothing to them; beyond that they want to go, and this going beyond the phenomenal is the very soul of religion. The characteristic of my nation is this transcendentalism, this struggle to go beyond, this daring to tear the veil off the face of nature and have at any risk, at any price, a glimpse of the beyond. That is our ideal, but of course all the people in a country cannot give up entirely. Do you want to enthuse them, then here is the way to do so. Your talks of politics, of social regeneration, your talks of money-making and commercialism — all these will roll off like water from a duck's back. This spirituality, then, is what you have to teach the world. Have we to learn anything else, have we to learn anything from the world? We have, perhaps, to gain a little in material knowledge, in the power of organisation, in the ability to handle powers, organising powers, in bringing the best results out of the smallest of causes. This perhaps to a certain extent we may learn from the West. But if any one preaches in India the ideal of eating and drinking and making merry, if any one wants to apotheosise the material world into a God, that man is a liar; he has no place in this holy land, the Indian mind does not want to listen to him. Ay, in spite of the sparkle and glitter of Western civilisation, in spite of all its polish and its marvellous manifestation of power, standing upon this platform, I tell them to their face that it is all vain. It is vanity of vanities. God alone lives. The soul alone lives. Spirituality alone lives. Hold on to that. Yet, perhaps, some sort of materialism, toned down to our own requirements, would be a blessing to many of our brothers who are not yet ripe for the highest truths. This is the mistake made in every country and in every society, and it is a greatly regrettable thing that in India, where it was always understood, the same mistake of forcing the highest truths on people who are not ready for them has been made of late. My method need not be yours. The Sannyasin, as you all know, is the ideal of the Hindu's life, and every one by our Shâstras is compelled to give up. Every Hindu who has tasted the fruits of this world must give up in the latter part of his life, and he who does not is not a Hindu and has no more right to call himself a Hindu. We know that this is the ideal — to give up after seeing and experiencing the vanity of things. Having found out that the heart of the material world is a mere hollow, containing only ashes, give it up and go back. The mind is circling forward, as it were, towards the senses, and that mind has to circle backwards; the Pravritti has to stop and the Nivritti has to begin. That is the ideal. But that ideal can only be realised after a certain amount of experience. We cannot teach the child the truth of renunciation; the child is a born optimist; his whole life is in his senses; his whole life is one mass of sense-enjoyment. So there are childlike men in every society who require a certain amount of experience, of enjoyment, to see through the vanity of it, and then renunciation will come to them. There has been ample provision made for them in our Books; but unfortunately, in later times, there has been a tendency to bind every one down by the same laws as those by which the Sannyasin is bound, and that is a great mistake. But for that a good deal of the poverty and the misery that you see in India need not have been. A poor man's life is hemmed in and bound down by tremendous spiritual and ethical laws for which he has no use. Hands off! Let the poor fellow enjoy himself a little, and then he will raise himself up, and renunciation will come to him of itself. Perhaps in this line, we can be taught something by the Western people; but we must be very cautious in learning these things. I am sorry to say that most of the examples one meets nowadays of men who have imbibed the Western ideas are more or less failures. There are two great obstacles on our path in India, the Scylla of old orthodoxy and the Charybdis of modern European civilisation. Of these two, I vote for the old orthodoxy, and not for the Europeanised system; for the old orthodox man may be ignorant, he may be crude, but he is a man, he has a faith, he has strength, he stands on his own feet; while the Europeanised man has no backbone, he is a mass of heterogeneous ideas picked up at random from every source — and these ideas are unassimilated, undigested, unharmonised. He does not stand on his own feet, and his head is turning round and round. Where is the motive power of his work? — in a few patronizing pats from the English people. His schemes of reforms, his vehement vituperations against the evils of certain social customs, have, as the mainspring, some European patronage. Why are some of our customs called evils? Because the Europeans say so. That is about the reason he gives. I would not submit to that. Stand and die in your own strength, if there is any sin in the world, it is weakness; avoid all weakness, for weakness is sin, weakness is death. These unbalanced creatures are not yet formed into distinct personalities; what are we to call them - men, women, or animals? While those old orthodox people were staunch and were men. There are still some excellent examples, and the one I want to present before you now is your Raja of Ramnad. Here you have a man than whom there is no more zealous a Hindu throughout the length and breadth of this land; here you have a prince than whom there is no prince in this land better informed in all affairs, both oriental and occidental, who takes from every nation whatever he can that is good. "Learn good knowledge with all devotion from the lowest caste. Learn the way to freedom, even if it comes from a Pariah, by serving him. If a woman is a jewel, take her in marriage even if she comes from a low family of the lowest caste." Such is the law laid down by our great and peerless legislator, the divine Manu. This is true. Stand on your own feet, and assimilate what you can; learn from every nation, take what is of use to you. But remember that as Hindus everything else must be subordinated to our own national ideals. Each man has a mission in life, which is the result of all his infinite past Karma. Each of you was born with a splendid heritage, which is the whole of the infinite past life of your glorious nation. Millions of your ancestors are watching, as it were, every action of yours, so be alert. And what is the mission with which every Hindu child is born? Have you not read the proud declaration of Manu regarding the Brahmin where he says that the birth of the Brahmin is "for the protection of the treasury of religion"? I should say that that is the mission not only of the Brahmin, but of every child, whether boy or girl, who is born in this blessed land "for the protection of the treasury of religion". And every other problem in life must be subordinated to that one principal theme. That is also the law of harmony in music. There may be a nation whose theme of life is political supremacy; religion and everything else must become subordinate to that one great theme of its life. But here is another nation whose great theme of life is spirituality and renunciation, whose one watchword is that this world is all vanity and a delusion of three days, and everything else, whether science or knowledge, enjoyment or powers, wealth, name, or fame, must be subordinated to that one theme. The secret of a true Hindu's character lies in the subordination of his knowledge of European sciences and learning, of his wealth, position, and name, to that one principal theme which is inborn in every Hindu child — the spirituality and purity of the race. Therefore between these two, the case of the orthodox man who has the whole of that life-spring of the race, spirituality, and the other man whose hands are full of Western imitation jewels but has no hold on the life-giving principle, spirituality — of these, I do not doubt that every one here will agree that we should choose the first, the orthodox, because there is some hope in him — he has the national theme, something to hold to; so he will live, but the other will die. Just as in the case of individuals, if the principle of life is undisturbed, if the principal function of that individual life is present, any injuries received as regards other functions are not serious, do not kill the individual, so, as long as this principal function of our life is not disturbed, nothing can destroy our nation. But mark you, if you give up that spirituality, leaving it aside to go after the materialising civilisation of the West, the result will be that in three generations you will be an extinct race; because the backbone of the nation will be broken, the foundation upon which the national edifice has been built will be undermined, and the result will be annihilation all round. Therefore, my friends, the way out is that first and foremost we must keep a firm hold on spirituality — that inestimable gift handed down to us by our ancient forefathers. Did you ever hear of a country where the greatest kings tried to trace their descent not to kings, not to robber-barons living in old castles who plundered poor travellers, but to semi-naked sages who lived in the forest? Did you ever hear of such a land? This is the land. In other countries great priests try to trace their descent to some king, but here the greatest kings would trace their descent to some ancient priest. Therefore, whether you believe in spirituality or not, for the sake of the national life, you have to get a hold on spirituality and keep to it. 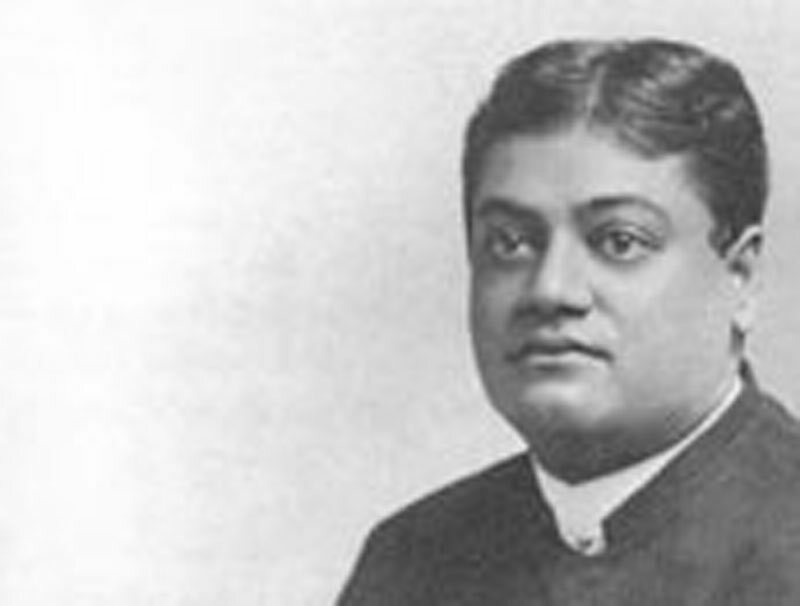 Then stretch the other hand out and gain all you can from other races, but everything must be subordinated to that one ideal of life; and out of that a wonderful, glorious, future India will come — I am sure it is coming — a greater India than ever was. Sages will spring up greater than all the ancient sages; and your ancestors will not only be satisfied, but I am sure, they will be proud from their positions in other worlds to look down upon their descendants, so glorious, and so great. Let us all work hard, my brethren; this is no time for sleep. On our work depends the coming of the India of the future. She is there ready waiting. She is only sleeping. Arise and awake and see her seated here on her eternal throne, rejuvenated, more glorious than she ever was — this motherland of ours. The idea of God was nowhere else ever so fully developed as in this motherland of ours, for the same idea of God never existed anywhere else. Perhaps you are astonished at my assertion; but show me any idea of God from any other scripture equal to ours; they have only clan-Gods, the God of the Jews, the God of the Arabs, and of such and such a race, and their God is fighting the Gods of the other races. But the idea of that beneficent, most merciful God, our father, our mother, our friend, the friend of our friends, the soul of our souls, is here and here alone. And may He who is the Shiva of the Shaivites, the Vishnu of the Vaishnavites, the Karma of the Karmis, the Buddha of the Buddhists, the Jina of the Jains, the Jehovah of the Christians and the Jews, the Allah of the Mohammedans, the Lord of every sect, the Brahman of the Vedantists, He the all-pervading, whose glory has been known only in this land — may He bless us, may He help us, may He give strength unto us, energy unto us, to carry this idea into practice. May that which we have listened to and studied become food to us, may it become strength in us, may it become energy in us to help each other; may we, the teacher and the taught, not be jealous of each other! Peace, peace, peace, in the name of Hari!